Shawn's done it again. Over at Branded in the 80's, his recent post featuring the MPC General Lee model has immediately conjured up some memories. Several months ago, I came across a box filled with old school papers and artwork from my childhood. 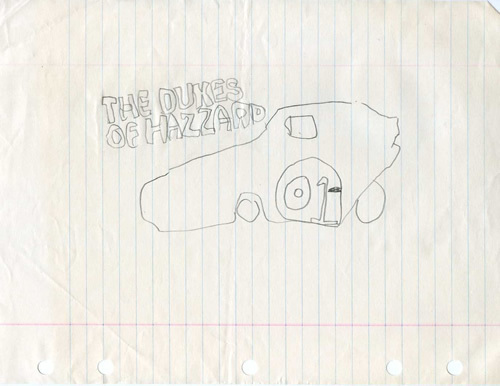 Among the piles of papers was a really crappy drawing of the General Lee. The lighting in the room must have been bad since I apparently abandoned my tracing effort and tried to finish this sketch on my own. 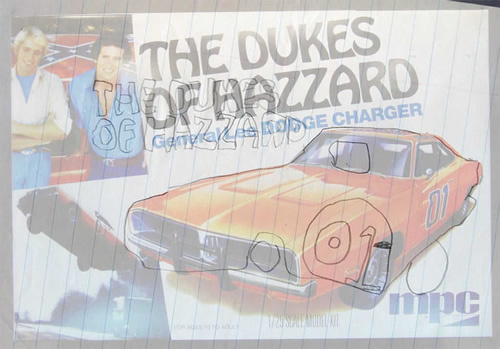 That explains why my General Lee drawing looks more like the product of a massive car accident rather than a lake-jumping television icon. I never had the patience to assemble a model car. I owned a few over the years (heck I still have a Back to the Future Delorean model in the box) but I don't think I ever got further than looking at the pieces and getting really discouraged. Same thing happened with puzzles... only it took a little longer to get discouraged. 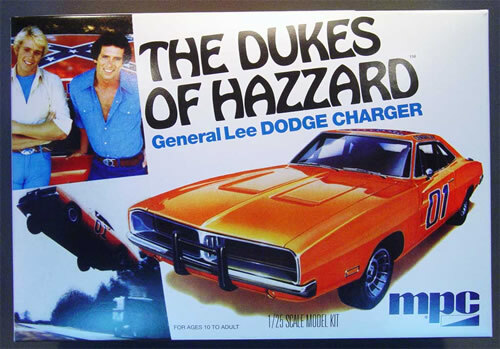 that picture you posted of the general lee box is the one i photographed with my computer. John -- Please post a link to where your picture is found. I typically do so to give credit where it is due but obviously neglected to do so here in my excitement over figuring out why my drawing was so bad!